On October 21st, I was invited to an exclusive dinner at Ruby Watch Co.. ZWILLING J.A. HENCKELS together with Ontario Pork (@OntarioPork) and chef Lora Kirk of Ruby Watch Co. (@RubyWatchco) teamed up for an evening of great products with great food. Prepared by chef Kirk, the evening consisted of a four-course, holiday-themed dinner using delicious Ontario pork, prepared and presented using an array of products within the ZWILLING portfolio of culinary brands. Wine pairings courtesy of Inniskillin (@InniskillinWine). The history of the ZWILLING J.A. HENCKELS brand starts on June 13, 1731 (under the Gemini star sign). It was on that day that knife-maker Peter Henckels from Solingen registered the "Twin" symbol as his trademark with the Cutlers' Guild of Solingen. Today, the premium German-based kitchenware manufacturer boasts a multi-brand portfolio that includes ZWILLING, MIYABI, STAUB and DEMEYERE, as well as the mass consumer brand J.A. HENCKELS INTERNATIONAL. ZWILLING Culinary Solutions ca be found in over 100 countries. This year, the company is marking its 110th anniversary in Canada. On display here is the STAUB line of traditional French enameled cast iron and ceramic cookware - La Cocotte "French Oven". Made exclusively in France, STAUB vessels feature vibrant coloured glazes in assorted shapes, sizes and functions. Acknowledged as the optimal platform for slow-cooking, the material density of cast iron retains and redistributes heat evenly. Its black matte enamel interior is ideal for braising and the unique spikes on their iconic flat lid provide the perfect surface to induce self-basting flavour enhancement. Each piece is adorned with a steel or brass knob and can even be accessorized with decorative figurines to provide further artistic expression. 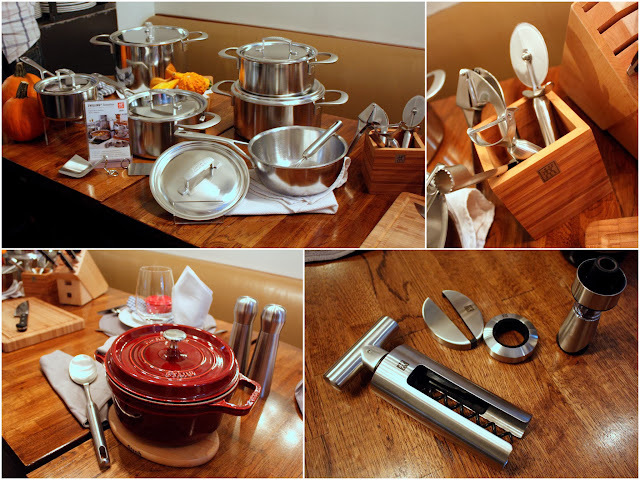 Other beautiful ZWILLING cookware, cutlery, tableware, and tools & gadgets on display. Chef Kirk created a mouth-watering family-style meal utilizing Ontario pork and prepared and presented using ZWILLING cutlery and cookware (flatware used by guests was from the ZWILLING BELLASERA line). Herbs and spices in STAUB ceramic bowls. My two favourite Inniskillin wines that evening: 2012 Reserve Riesling & 2012 Sparkling Cabernet Franc Icewine. Thank you ZWILLING J.A. 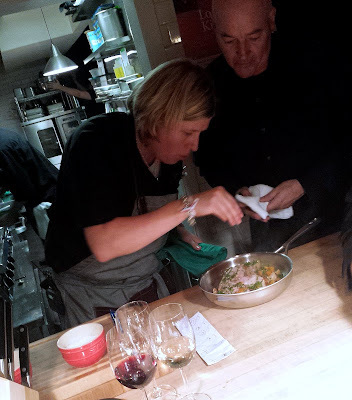 HENCKELS, Ontario Pork and chef Kirk of Ruby Watch Co. for a wonderful evening. Chef Kirk's rustic, family-style comfort menu was festive and homey, ideal for the upcoming holiday season. I loved the different ways in which pork was presented in each and every course especially the coffee-cured bacon and the maple bacon ice cream! The highlight that evening was definitely the slow-roasted porchetta. Served in a large STAUB cast-iron family-sized pot, it was a show-stopper. All in all, the entire meal was tasty, unique and creative with wonderful wine pairings to boot!